$5 off admission pass at http://www.barsinister.net/images/FACEBOOK-DISC-FLYR21.jpg which you can now use on any night for $5 off admission before 11pm for 21yrs and older! Print out …or show us it on your phone! 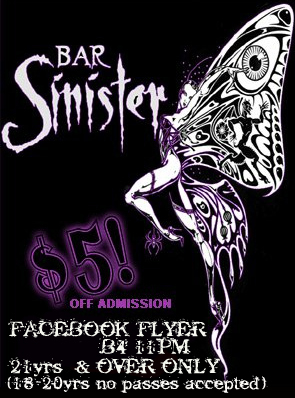 WEAR A BAR SINISTER T-SHIRT GET IN FOR $5 Off ALL NIGHT!! $2 Coat Check By the Lovely Miss Jen! EmaiL Us to ReServe a Table w/ the PurchaSe of Bottle SerVice! FIRST TIME HERE? Let’s give you a little guide……..